So I was particularly wary when making accommodations internationally. I’m happy with a place that’s clean, convenient and reasonably secure. I’d rather spend money on things to do and see rather than places to sleep. 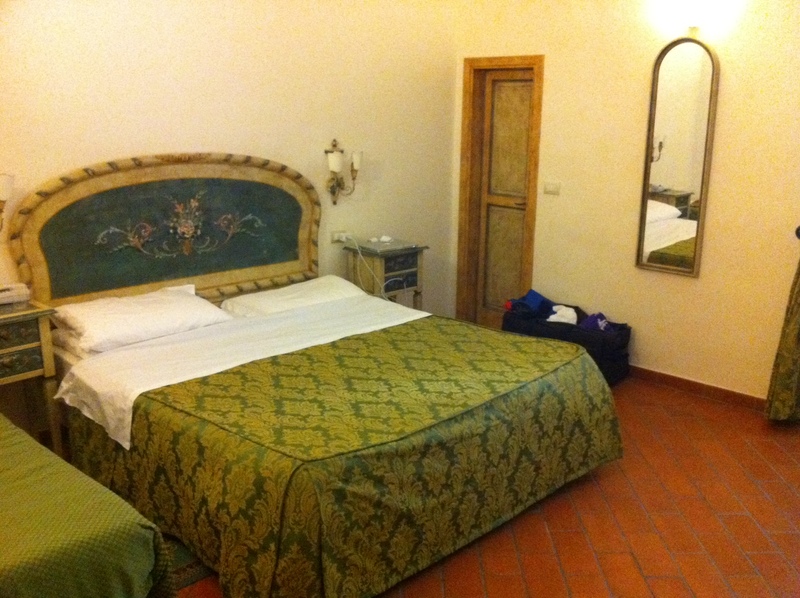 But after some reading and research, I took a shot at a place called Hotel Europa in Florence. It is well-situated for the sights I want to see in the city, and the price was reasonable. But remembering our other disasters, I was a little concerned when our cab pulled up in front of a nondescript door, set in a building that undoubtedly dates back several centuries. The creaky elevator, with room for only one person with a big bag, was like something out an old spy movie. If not for the bags, both my companion and I could have plodded up to the 3rd floor check-in faster on foot. As our host accompanied us to our room, I have to admit I wasn’t expecting much. But when he swung the door open, I was in for a nice surprise. 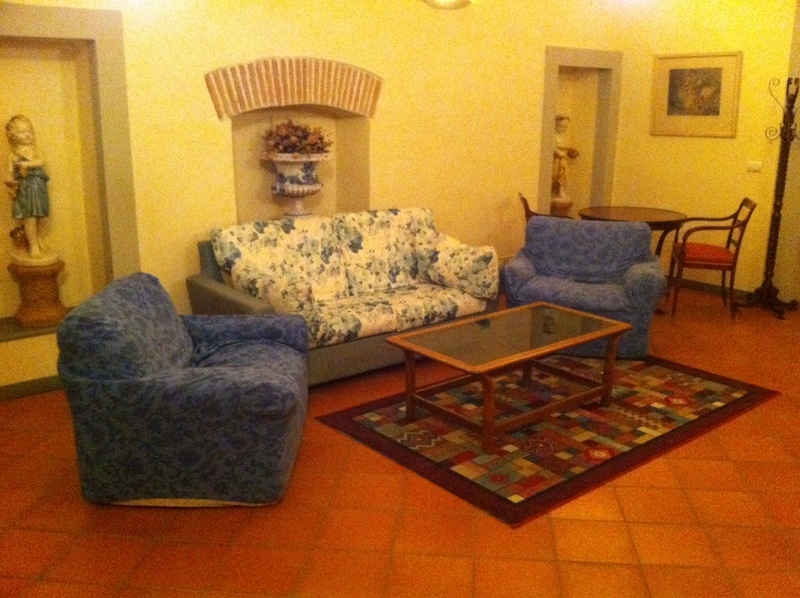 The room is huge, the furnishings charming. The ceilings are at least 12 feet high, the 12-inch thick plaster walls keep the place cool in the afternoon sun, and superbly quiet at night. When I pulled the tall shutters back on the wide casement window, the view below was a tiny courtyard with a patio and a pretty little tree with ripening oranges. 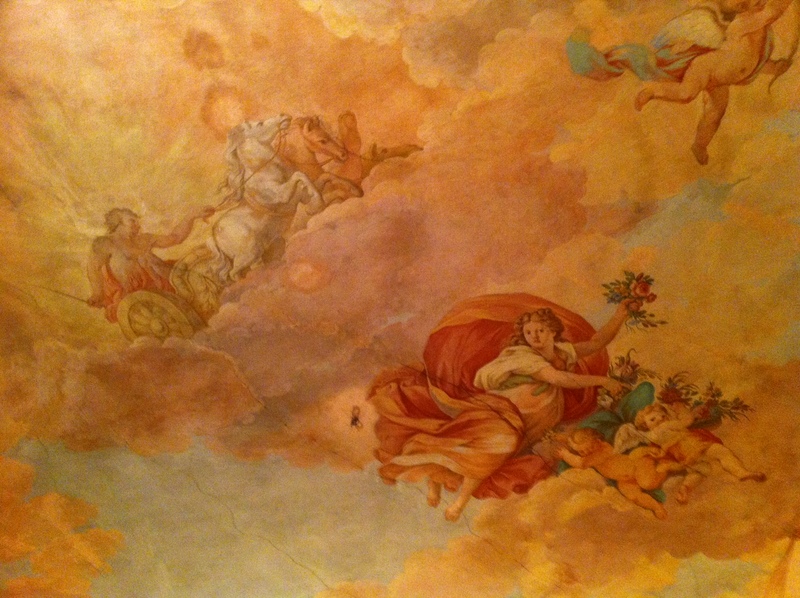 There’s even a spacious sitting room down the hall, complete with a mural on the ceiling. Part of a great trip is feeling good with where you stay. This time we found a great place, full of character. Too bad my little dog isn’t along to enjoy it too. Enchanting! Your words and pictures draw us into such a charming place. Lucky you to find a lovely boutique hotel for your European adventure. May the rest of your lodging be as wonderful. Now what all of your girlfriends want to know: Have you had fun shopping? Yes, some shopping fun has occurred. There’s a covered bridge in the city with jewlelry shop after jewlelry shop down each side. Some time was spent there. Wow, That’s beautiful. And Florence is such a beautiful city, too. It sounds quite fab. 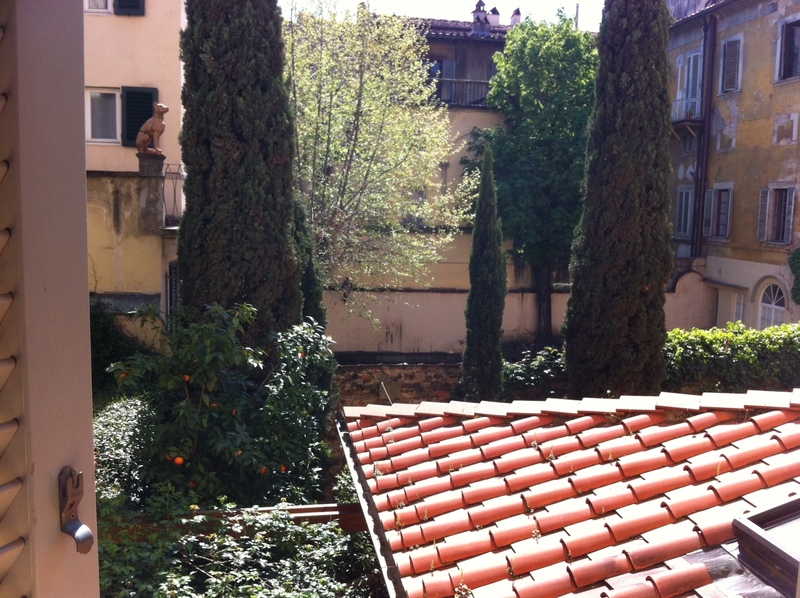 Oh, to be in Florence! Love the sight, feelings and beauty. Thanks for sharing!